The Shape Up Programme is designed to give you an inexpensive, simple and convenient way to get the nutrition you need while losing weight and toning up. The programme is based on replacing 2 meals per day with healthy protein shakes as well as having 1 healthy meal per day, with additional supplements to assist the weight loss process. The function of each product is described fully below. We will ensure your order reaches you in the shortest possible time. The majority of orders are delivered within 2-3 business days. We provide an email-based consulting service for those that wish to make use of it. We ensure that all your questions regarding Herbalife product usage are answered and can guide you through the weight loss process. Our Weight Loss Programme Guide gives easy step by step instructions as well as a comprehensive guide to healthy snacks. Contains over 20 essential nutrients and antioxidants in a herbal base. It has been scientifically developed to provide nutritional support for individuals who may not obtain an adequate amount of essential nutrients from the daily diet. Supports the healthy elimination of water and promotes the appearance of healthy looking skin. The Herbalife Weight Loss Programme is primarily based on healthy meal replacement and improved nutrient absorption by the body. At the core of each programme is the meal replacement shake. This provides a fast, healthy meal with high quality protein as well as vitamins and minerals. 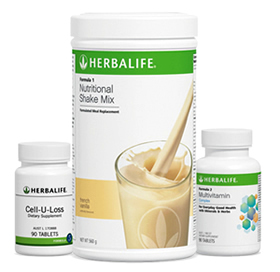 The shake takes only a few minutes to prepare and is taken twice a day to replace two meals. The third meal, which can be either lunch or dinner should be a healthy meal containing protein and vegetables, but not too high in carbohydrates. In addition the Multivitamin is taken twice daily and assists in adding the optimum nutritional balance to the body as well as boosting the immune system. Additional supplements can help with healthy nutrient absorption and the efficient elimination of waste.